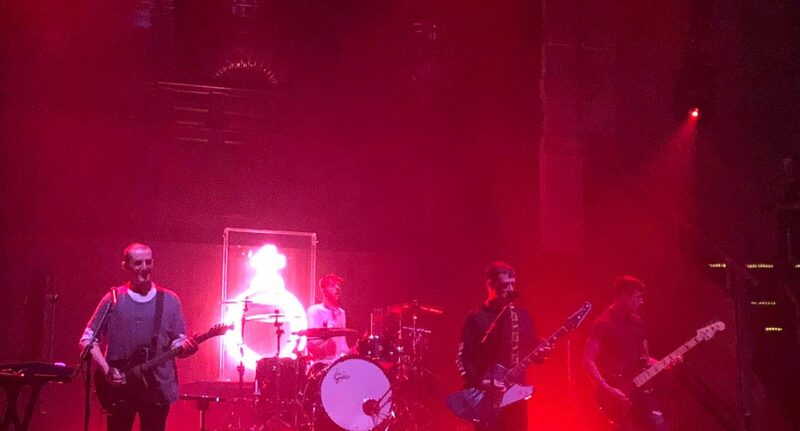 Alt-Rock quartet Deaf Havana finally brought their latest tour to Manchester’s Albert Hall to a huge crowd who had long awaited their arrival in the north. Having spent months touring Europe, the band hailing from Norfolk finally had the opportunity to play some new tracks from their latest album ‘Ritual’. This gig comes way ahead of the summer festival season in which they are set to play a number of highly anticipated festival such as 2000trees. However, before their arrival we were treated to the boisterous La Fontaines who provided an exceptionally energetic supporting slot, taking full advantage of the glorious space that is the Albert Hall. The three-piece alt-rock band from Motherwell, Scotland, launched through their set with some serious conviction. Across the fairly extensive show, there featured a mixture of tracks from their previous album 2017’s Common Problems with some exciting new material from their latest album Junior. The dynamic displayed between the band members was really quite unique, with Drummer Jamie Keenan delivering some blisteringly corse vocals on many of the tracks. Not to be outdone by his bandmates, lead singer Kerr Okan threw himself about the stage and kept the energy at a pretty dizzying high. I was really quite captivated by their command for attention and stage presence. A factor that couldn’t be denied was their overuse of a backing track though unfortunately. As much as their live performance was intriguing, It did not quite have that live feeling that really would have given that extra edge on other artists. Needless to say, the crowd was thoroughly warmed up for the main event which in many cases can be such a difficult balance to strike, particularly when the crowd you are playing to is only mildly interested. Then the room swam with bright neon lights as Deaf Havana emerged from the cathedral-like depths of the stage, their logo glowing with a stark lucidity that somehow elegantly contrasted their surroundings. The expectation and excitement began to build but as lead singer James Veck-Gilodi’s vocals slowly filled the space, the band looked lost amongst their environment. Perhaps the long tour across Europe had sapped their energy ever so slightly but I couldn’t help but detect a distinct lack of enthusiasm. Tracks such as ‘Mildred’ and ‘Worship’ came and went without having a real impact amongst the setlist. A helpful rejuvenation came in the form of track “Hell” which was supported by La Fontaine’s Kerr Okan who helped up the intensity and energy massively. The title track ‘Ritual’ offered a beautiful contrast which really set the tone for the gig and confirmed that the band has perhaps naturally subdued their style since their earlier releases. The crowd, mainly made up of couples I might add, seemed content with the experience but I cannot deny that it was great to hear “Sinner” ring out across the venue and introduce a bit of riotous energy to the gig. It was a shame, then, that this track was the conclusion of the encore. The band’s performance didn’t offer anything vastly unexpected or new but it most definitely provided insight into where Deaf Havana are going musically. I expect that the indie-pop genre will soon be within their sights.